Hours after a game, the night long since dark and deep, New York Yankees catcher Jorge Posada still sees pitches hurtling toward his mitt, most of them flirting with either danger or a corner. "That one was a strike!" he snaps as he runs the replay machine in his mind. Catchers are the stationmasters of a baseball game. They can send the game down different tracks simply by calling a particular pitch. Action in a game begins with the catcher's signal, a responsibility Posada doesn't easily shed. "Ahh! Should've called the fastball!" he barks. The outbursts continue with surprising frequency throughout the night. Still, there is something even more remarkable about this scene. Posada is asleep. "It goes on all night. All night!" says his wife, Laura, whose own rest is repeatedly interrupted by Jorge's self-criticism. "It's worse when the Yankees lose." Adds Posada, "If I get up at four o'clock in the morning to go to the bathroom, that's what I'm thinking about--catching. Sometimes I'll take a nap in the afternoon. I swear, I'm more rested after napping for an hour, hour and a half, than I am after a full night of sleep. I can't let go of the game easily. I take it home." The Yankees have an unmatched set of Ming vases in their starting rotation--Roger Clemens, Andy Pettitte, Mike Mussina and Orlando Hernandez have a combined .641 career winning percentage (555-311), through Sunday, and $40 million annual income. Posada, 29, is the conscientious curator, cajoling, encouraging, counseling and, all right, outright provoking his pitchers in his waking and sleeping moments alike. As if his stewardship weren't enough, Posada also is a keen-eyed, switch-hitting operative at bat. In 2000 he led major league catchers in on-base percentage (.417) while hitting more home runs in a season (26 at the position, 28 overall) than any Yankees catcher except Yogi Berra and being named an All-Star in his first year as New York's every-day receiver. This year he was off to a .289 start, with six home runs and 18 runs batted in at week's end. "All of this is a major surprise," says his father, also named Jorge, a scout for the Colorado Rockies. "A major surprise." As a 24th-round draft pick in 1990 Posada was such an uncertain prospect that he signed with the Yankees only after his father had extracted a promise from New York not to cut him in his first three seasons in the farm system. Posada was a second baseman during his first minor league season, and his successful conversion from that position to catcher is thought by many baseball people to be unprecedented in recent memory. As if to heighten the difficulty of his journey, Posada survived a hideous home plate collision in 1994 in which he broke his left leg and dislocated his left ankle while playing for the Triple A Columbus Clippers. He also survived a three-year apprenticeship, from '97 through '99, behind Yankees catcher Joe Girardi and a humiliating defensive slump in '99 that prompted owner George Steinbrenner to order him to get his eyes checked. His vision was fine. Nothing, though, tested Posada as harshly as the events of last Aug. 2, when he sat in his and Laura's apartment on Manhattan's East Side, having been secretly excused by manager Joe Torre from a game that day, while his eight-month-old son, Jorge Jr., lay on an operating table at a nearby hospital for eight hours. To correct a congenital condition known as craniosynostosis, in which the plates of the skull prematurely knit and cause the growing head to become misshapen, surgeons had to cut open Jorge Jr.'s head from ear to ear. While hospital officials gave the Posadas hourly updates by telephone, surgeons removed Jorge Jr.'s skull piece by piece and placed the parts on a table like a jigsaw puzzle. After breaking some cranial pieces apart to allow for normal brain and head growth, they rebuilt the skull and sewed up Jorge Jr.
As his parents stood over his bed two days later, little Jorge opened his eyes for the first time since the operation and a day earlier than doctors thought he would be coherent. He let out a little grunt. He would be fine. His father, having staggered through a 1-for-15 slump before and immediately after the surgery, broke free with four hits that night and two home runs the next afternoon. "I grew up real fast last year," he says. "Baseball always was everything to me. Don't get me wrong, it's still very important. But now I look at it in a different way. You gain perspective." Born in Santurce, Puerto Rico, Posada played shortstop in high school, where he also dabbled in basketball, track, volleyball and, on one occasion, umpiring girls' softball. ("I thought the pitcher was cute," he says.) The Yankees drafted him out of high school, but his father wanted him to go Stateside to improve his skills and get an education before he turned pro. Jorge's hopes of attending a four-year school ended when he failed to score high enough on the SAT. Fred Frickie, the baseball coach at Calhoun Community College in Decatur, Ala., offered him a scholarship, sight unseen, on the advice of other coaches. Posada, who knew nothing about the school, accepted. "After my first night there I said to myself, What the hell am I doing here?" he says. "I called home and cried. My mother cried, but she told me I had to be strong. That first year I got into fights every week. There was some racism. I didn't speak much English, and guys made fun of me, this Puerto Rican drafted by the Yankees. I didn't like what they were saying, so I'd fight." Leon Wurth, the scout who would eventually sign Posada, first saw him play in a 1990 game at Volunteer State, a junior college in Gallatin, Tenn. He liked his bat and his arm. "I didn't think he projected to be a major league shortstop, but I saw the tools and thought he could find a place," Wurth says. "One thing I saw in him was his energy and his enthusiasm on the field. I marked down Jorge as having a good attitude, and I thought that would serve him well. Looking back I realize I was wrong. His attitude is great. He's overcome a lot of things to be an All-Star catcher--switching from the infield, breaking his leg--and you don't do that without hard work." The Yankees drafted Posada again in the summer of 1990, but he decided to play another season at Calhoun. After his sophomore season he was with a summer league team in Alabama when Wurth asked him to catch one game. "He didn't flinch back there," Wurth says. One week before Posada would have gone back into the draft, the Yankees assured his father that they would not cut young Jorge in the next three years, and he signed for about $30,000. Posada hit .235 at Class A Oneonta in 1991 and led New York-Penn League second basemen in double plays. It was after that season, in the Fall Instructional League, that the Yankees moved him to catcher, mostly because he lacked a middle infielder's speed. "If I hadn't been switched, I'd probably be working some job in Puerto Rico right now," Posada says. "I'd have been one of those guys who was out of baseball after two or three years." Posada needed seasoning--he turned 26 in his first full year in the big leagues, 1997, and even then appeared in only 60 games--but other organizations noticed his skills. 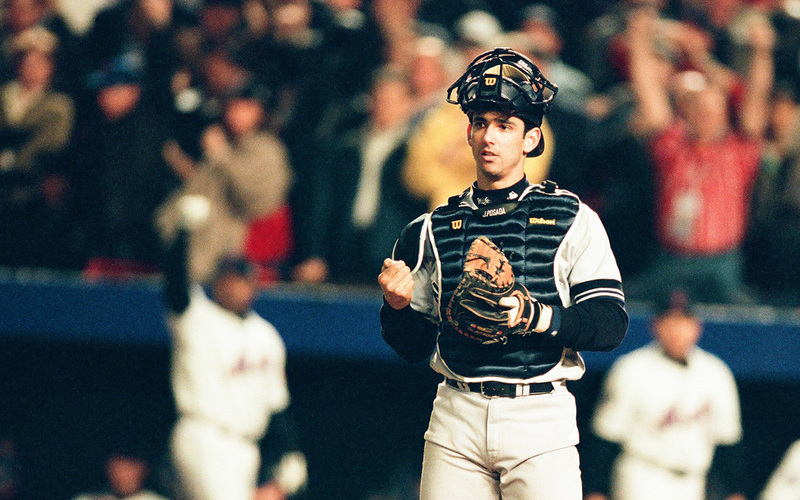 The Seattle Mariners asked for Posada in a trade as far back as '95, in the five-player deal in which New York obtained first baseman Tino Martinez. The Montreal Expos twice tried to get him in '97 while shopping Mike Lansing and Pedro Martinez. The Texas Rangers asked for him in 1998 while exploring the possibility of trading Ivan Rodriguez. The Florida Marlins asked for Posada twice that year while attempting to deal first Mike Piazza and later Luis Castillo. The Yankees refused to trade him. "He's a high on-base percentage guy [his combined career on-base and slugging percentages, .839, exceeds Ivan Rodriguez's .822], and I always liked having lefthanded bats in Yankee Stadium," says Yankees scout Gene Michael. "I thought he could have been the regular catcher earlier, but the pitchers expressed a desire to pitch to Joe Girardi. They just didn't know Jorge." Then, in something of a graduation ceremony, Torre started Posada, not Girardi, with Clemens pitching in the clinching game of the 1999 World Series, a 4-1 victory over the Atlanta Braves in which Clemens threw 7 2/3 innings of one-run ball. "We had no doubts Jorge was ready," general manager Brian Cashman says. Posada's expert caretaking of the Yankees' pitchers is all the more remarkable, given that he began in pro ball as an infielder. "I've talked about it with other scouts, and nobody can come up with another catcher who started out as a middle infielder," Wurth says. Says Clemens, "Whether I call 80 percent of the game or he calls 80 percent, we work real well together. Some games I don't have good life on my fastball, and I want him to tell me that. Some guys will say it's good when it's not. But Jorge will say, 'It's going to be a scuffle today. Stay with me.'" With Pettitte, Posada must be a conciliator. "His problem is he's a perfectionist," Posada says of Pettitte, who will scold himself aloud on the mound for poor pitches--the cue for Posada to visit the mound to deliver a reassuring message. Mussina, the new Yankee, is a bit of a mystery to Posada. "Mike doesn't say much," he says, "so I'm still trying to read him. But he's easy to catch because he can throw any pitch in any count for a strike." Posada's relationship with Hernandez is easily the most flammable. They regularly argue in the dugout and on the mound. "It's like we're going to fight sometimes," Posada says. In a typical exchange between the duo, Posada once put down one finger for a fastball. Hernandez shook him off. Posada put down two fingers for a curveball. Hernandez shook him off. Posada put down three fingers for a slider. Hernandez shook him off. Posada put down four fingers for a changeup. Hernandez shook him off. Out of pitches and patience, Posada stormed out to the mound. "What the hell do you want to throw?" he remembers having asked Hernandez in Spanish. "That's what I called for first!" Posada said. "I know," Hernandez said. "I just wanted to make the batter think." "What do you want to be, a psychologist or a pitcher? Just throw the ball!" Posada yelled and then wheeled around and headed back to the plate. "I like it when we go at it," Hernandez said last week. "In fact, I was saying to him five minutes ago that we haven't been fighting enough lately. We need to start yelling at each other again." Laura, Jorge and Jorge Jr. arrive at a Manhattan restaurant for lunch, Jorge toting the diaper bag. Jorge saw Laura at a party in Puerto Rico after the 1997 season and told a friend, "If I ever get to go out with her, this is the girl I'm going to marry." Soon they did go out, and a thought struck Jorge: This girl looks familiar. The softball pitcher! "Eight years [after high school], and he knew my uniform number, the color of our uniform, how I wore my socks and my hair, everything," Laura says. Laura, a law student at the time, decided she wasn't interested in dating someone who was about to leave for a nine-month baseball season. Right about then, in January 1998, Jorge kissed her for the first time. "I'll see you tomorrow," she said, swooning. They were married three years later. Jorge Jr. has a checkup scheduled for August, one year after his surgery. Doctors will determine then if he should undergo another, similar operation. "In the mirror," Jorge says, "you can still see his head is a little uneven. I want him to be exactly right." Last fall Posada established his own charitable foundation, which devotes most of its resources to craniosynostosis. "Sometimes I can't believe how everything has worked out for me," he says. His world can't be perfect. It is, after all, a catcher's world. There are too many pitches that go awry, too many wrong signals. Just the previous night Seattle's Edgar Martinez had beaten Mussina and the Yankees with a tiebreaking, two-run double in the seventh inning. "A changeup," Posada says. "He hadn't seen that pitch the entire game. The whole game! We throw him one, and he's all over it." Posada shakes his head. He has a look on his face that makes you certain he had been talking about that pitch all night.